Ballantine Books, US, 2010. Hardcover. Book Condition: Near Fine. Dust Jacket Condition: Near Fine. 1st Edition. Signed, lined with a quote from the book and dated 1st US hb edn. See also my SLD copy of "Blackout". With light shelf wear. Synopsis : All Clear is the magisterial conclusion to Connie Willis¿s epic, two-volume account of love, war, and time travel. Like its predecessor, Blackout, it is both a brilliantly constructed work of science fiction and a masterful recreation of a pivotal moment in 20th century history. The story begins in the immediate aftermath of Blackout. 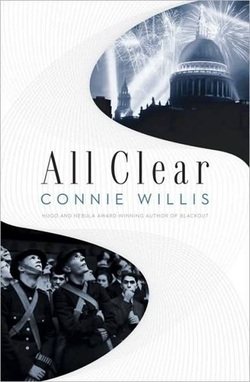 Three time-travelling scholars, each investigating a different aspect of World War II, are stranded together in London during the height of the Blitz. Their increasingly desperate attempts to return ¿home¿ to the year 2060 form the core of a narrative that ranges freely, and with great authority, across time and space, from the evacuation of Dunkirk to the ultimate triumph of V-E Day ¿ and beyond. The result is a work of great ingenuity and bottomless humanity that uses chaos theory, meticulous research, and a dizzying array of temporal paradoxes to reconstruct a vanished era, illuminating that era through the varied perspectives of the soldiers, sailors, shop girls, and ambulance drivers who struggled through it. Together, Blackout and All Clear constitute a seamless, deeply moving masterpiece that will be read ¿ and remembered ¿ for many years to come. Signed by Author(s). NOTE - I have SLD copies of "Blackout" available, as well as triple-signed (very rare) copies of "Fire Watch", the novella that started this amazing series. Please check out my other titles.